The patriarch of the Common Man Family of Restaurants arrives tired, disheveled and covered with soot, a half-hour late for a scheduled interview at his Italian Farmhouse restaurant in Plymouth, one of his nearly two-dozen restaurants that dot the New Hampshire landscape from Plymouth to Windham to Claremont. Alex Ray apologizes for being late and seems to have a hard time believing it’s OK. “Thank you for saying that,” he says. It is the kind of day that makes it hard for a weary man to accept a lot of things — like his decision to buy a boat. “I had a boat 30 years ago and never used it,” he says. “I only bought it because a friend wanted to sell it.” But he recently acquired another motorboat and a couple of hours ago he took it out on the water. But not for long. It had sprung a leak and was taking on water. He had to get it back to shore before it — and he — sank. And that wasn’t his only problem. But at least he had found his cell phone — in the middle of the road, where it had been run over by a passing car. It must have fallen out of the boat, he explains, as it was being towed back to its dock. It is useless now, but he has it with him anyway, clutching it, perhaps, as a souvenir of the Day Everything Went Wrong. “See?” he says, holding out the phone to show its shattered face. “I couldn’t call. I can’t call anyone. Someone called me and I can’t call him back. I don’t even know who it was.” As he’s talking, the phone starts its musical ring. “I can’t even turn that off. … Well, yeah, I guess I can stop it,” he says as he finds a way to silence the distraction. It has not been, one suspects, a typical day in the life of Alex Ray. But it’s more than the day’s misadventure on the lake and a disabled cell phone that is troubling him. Seated on a granite bench in front of the large barn he had built behind the restaurant, Ray, at 74, begins ruminating over the nearly half a century he has spent building and expanding his impressive network of restaurants. In that, to be sure, he has been enormously successful. And that success has made him, one might reasonably guess, quite wealthy. The time in Ray’s life began on an April day in 1944, when he was born the second of four children to Lew and Elizabeth Ray in Mountain Lake, New Jersey. His highly driven, seemingly tireless work ethic (“His motor never stops,” says Sheila Heald, kitchen manager at the original Common Man restaurant in Ashland) took root early in life. As a young boy he had not one paper route, but several, delivering morning and evening papers both before and after school. His devotion to profitable labor is something he grew up with. The Common Man on Main Street in Ashland was Ray’s first restaurant, opened in 1971. “My father was a hard worker. He started his own vending machine business. That was his lifelong work. I would go to bed at night, listening to the sound of him counting coins.” His mother worked as a buyer in the clothing industry. The energy that young Ray expended on his paper routes didn’t prevent him from being a restless cut-up at school, clowning in the hallways, making jokes in class and making frequent, unwelcomed visits to the principal’s office. “I was always in the principal’s office,” he says. “I was rebellious, a clown.” He believes he had attention deficit disorder before that affliction was discovered. The pattern continued in Kennett High School in Conway after the Ray family moved to New Hampshire. He worked after school at a local restaurant, and held down two jobs in the summer, one at a local bakery and the other at the restaurant at the Mount Cranmore ski resort. He thrived on the work, but was, at best, an indifferent student. One of his high school teachers was Lou D’Allesandro, now an 11-term state senator from Manchester, but back then he was a new history and civics teacher at Kennett. “Well, he probably wasn’t an ‘A’ student,” D’Allesandro recalls in what might be considered an understatement, considering Ray’s own description of his high school years. “I don’t think he really liked school, and if you don’t like school, you don’t pay a lot of attention.” D’Allesandro even uses the word “cantankerous” to describe the attitude sometimes displayed by the young Ray, though he does not recall any specific incident from more than 50 years ago. .After high school, he enrolled in the Culinary Institute of America, then located in New Haven, Connecticut. His first full-time, year-round job was with a food service company called Canteen Corporation. He had charge of the cafeteria at Sanders Associates’ (now BAE) Manchester location and later at the Nashua plants on Canal Street and on Spit Brook Road. He knew early on that this was not where he would build a career. “The corporate world did not agree with me,” he recalls. “I circumvented their rules, just like in school.” When he was told that he wasn’t “corporate material,” Ray agreed and quit the job. Over the next few years, he moved about New Hampshire’s Lakes Region, running a pizza barn, and later a motel, and working for a time as a mason tender. With a loan from a local bank, he was able to buy a brick house on Main Street in Ashland. Living with his family on the second floor, he turned the ground floor into a restaurant, christening it the Common Man. 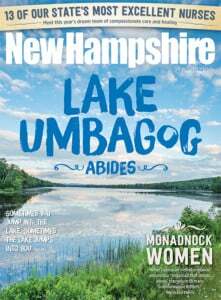 “We thought of a name that would play to the local people, from the banker to the carpenter, and I wanted it to be as basic as it could be, no frills,” he said in a 2007 interview with New Hampshire Business Review. The small restaurant opened in 1971 with a dining room that could only seat 35. Customers, even in winter, would stand in line outside, waiting for a table. Three years later, Ray and his family were able to move to a new home in Holderness, and the Common Man was expanded, with the renovated upper floor converted to the “Step Above” lounge. “I’m a slow grower,” Ray says. “It wasn’t until 1986 that we opened in Lincoln. That was number two.” But once started, there was nothing slow about the making of that second restaurant. Having purchased the Pollard Family home in October of 1985, Ray had an old barn moved onto the site, renovated it and attached it to the house to create a new restaurant that opened 47 days after purchase of the property. From that point on, it was full speed ahead in the expansion of the Common Man brand. Common Man Vice President Diane Dowling, members of the management team and Ray look over plans for the renovation of the building that would become the Common Man Merrimack. It’s the former homestead of Matthew Thornton, one of the signers of the Declaration of Independence. Ray acquired the Howard Johnson’s in Concord in 1987 and converted it into the Capital City diner before replacing it with the two-story, Colonial-style Common Man restaurant that stands at the north end of Concord’s busy downtown. The Tilt’n Diner, with its ’50s-style music and décor, was added in 1992. He opened the Italian Farmhouse in Plymouth the following year and the Squam Seafood Company in 1994. A renovated barn became the Common Man in Windham in 1996. Several more restaurants were added over the next decade, including the former Hannah Jack Tavern in Merrimack, a restaurant and lounge located in the converted home of Matthew Thornton, one of New Hampshire’s signers of the Declaration of Independence. Bobby’s Girl diner on Route 104 in New Hampton became Ray’s 104 Diner in 2009, the same year the enterprise expanded to New Hampshire’s Seacoast with the opening of a Common Man restaurant in Portsmouth, which has since closed. That’s only a partial list of the enterprises launched by the “slow grower” from Holderness. It does not include the restaurants he has opened within and around the numerous Meredith properties of developer Rusty McLear, founder of the popular Lakes Region resort, The Inn at Mill Falls. Nor does it include the joint venture by McLear and Ray to turn abandoned mill buildings into a hotel and restaurant complex in Claremont, or their multimillion-dollar development of the Common Man restaurants and the general stores, filling stations and larger state liquor stores at the new welcome centers on I-93 in Hooksett. And a good many travelers enroute to and from the airport in Manchester/Londonderry have frequented Ray’s Airport Diner on the site of the Holiday Inn on Brown Avenue. In all, Ray reigns over an enterprise that numbers about 1,000 employees. “It’s a challenge at times,” says Ida Gould, the office secretary, whose job it is to “keep the schedule, answer the phone, do whatever else needs to be done,” from her desk on the second floor of the former Ashland Post Office building that Ray and Common Man Vice President Diane Downing converted into The Common Man Company Store, right across the street from the restaurant where it all began. “He does manage 22 properties so there could be a lot happening at one time,” notes Gould. And while Ray leans on his staff to keep things running smoothly, he keeps his own eyes closely on the operations of all his properties. 1974 -Common Man Ashland is expanded to seat 50 guests. 1977 -Step Above Lounge at Common Man Ashland opens. 1985 -Common Man Lincoln opens. 1987 -Howard Johnson in Concord is converted to the Capital City Diner. 1993 -Italian Farmhouse opens in Plymouth. 1995 -Boathouse Grille opens at the Inn at Bay Point in Meredith. 1996 -The Common Man Company Store opens in Ashland and NH Common Man Windham opens. 1998 -Camp opens at Chase House in Meredith. 1999 -Capital City Diner is converted to Common Man Concord. 1999 -Town Docks opens in Meredith. 2000 -Common Man Lincoln burns down and is rebuilt in 60 days. 2002 -Common Man Inn & Spa and Foster’s Boiler Room open in Plymouth. 2004 -Lakehouse opens at Church Landing in Meredith and Lago replaces the Boathouse Grille in Meredith. 2008 -Webster Place Recovery Center opens in Franklin and Common Man Express (now closed) opens in Ashland. 2009 -Common Man Inn & Restaurant Claremont and Common Man Portsmouth (now closed) open. 2009 -104 Diner opens in New Hampton. 2009 -The Flying Monkey Movie House opens in Plymouth. 2011 -The Common Man Family celebrates 40 years. 2018 -The Barn on the Pemi event facility opens in Plymouth. “He gets a weekly report on all the restaurants — the sales, food costs, labor costs,” Gould says. “If he sees a pattern of something going wrong, he’ll look at that restaurant to see what’s happening.” He’s also a hands-on manager in a more literal sense. “Oh, yeah, he’ll pick up the garbage,” Gould says, speaking of but one of the manual tasks into which Ray might plunge at any time. “He’s definitely getting his hands dirty.” And he has a variety of moods to go along with his wide variety of tasks. The phenomenal growth of the enterprise has not been without its occasional setbacks, including the fire that destroyed the Common Man in Lincoln in 2001. What must have seemed like a major calamity at the time now looks like a mere hiccup in Common Man history. The employees at Lincoln were promptly reassigned to Ray’s other establishments, and the Lincoln restaurant was rebuilt in a mere 60 days. Ray, who spends a lot of time on New Hampshire’s highways, traveling among his many establishments, takes pride in the fact that his restaurant and diners are all different in design and architecture. Along with his many business ventures, Ray has found time to plunge into a wide range of community activities, including theatrical productions at Plymouth State University. “He’s an amazing man,” says Trish Lindberg, professor of education and integrated arts at PSU. Ray has both appeared in numerous plays and done a number of innovative things behind the scenes for Lindberg’s touring children’s theater, formally known as Theater Integrating Guidance, Education and Responsibility, or TIGER. Ray took a van and, with the help of graphic artist Sally Grand, had it decorated it with a large image of a tiger. He even managed to give the vehicle a lynx-like voice. Speaking onstage when The Flying Monkey opened, Ray prepares to shoot a toy flying monkey into the crowd. Ray seems less impressed with his onstage persona. “I played a beggar in ‘Fiddler on the Roof,’” he recalls. “I could have hammed it up, but I didn’t. I kind of regret it.” But it was his role as the Flying Monkey in a production of “The Wizard of Oz” that gave the name to yet another theater project. In 2009, Ray purchased a falling-apart old theater on Main Street in Plymouth, where vaudeville shows had been performed in the 1920s. The renovated building was reopened the following year as the Flying Monkey Movie House and Performing Center, a venue that hosts appearances by national recording artists, along with comedy acts, movies and live theatrical performances. “It’s as good as the Palace in Manchester,” Ray contends. Another of his projects, less entertaining but more life-sustaining, can be found at what is now known as the Ray House at the site of the Daniel Webster homestead in Franklin. Ray purchased the former orphanage and renovated it for use as an alcohol and drug abuse rehabilitation center. “I ended up buying it for next to nothing,” he says. “I put a million into it and sold it for what I’d put into it.” The buyer was Easterseals NH, which merged the facility with its Farnum Center recovery site in Manchester to create Farnum North. A 2015 campaign to raise money for expansion of the facility was sparked by Ray’s pledge to match all contributions, up to a total of $100,000. With the matching funds, the campaign raised more than $280,000 in just 30 days. Ray freely acknowledges his interest in the recovery efforts is inspired by his own journey as a recovering alcoholic. One might wonder how, between attending to expansive business operations and throwing himself into a variety of community projects, Ray could find the time for more of a social life. It’s not out of the ordinary to find him presiding over and providing food for two fundraisers in one day, as he did last year, running a “Fun Fair” to benefit the Bridge House, a 26-bed homeless shelter in Plymouth, as well as hosting the annual fundraising event for the Squam Lakes Natural Science Center in Holderness. Contributing to the community is no one-man effort for Ray, who encourages all of his employees to take paid time off from their duties at the restaurants each year to do volunteer work for the nonprofits of their choice. Despite the time, effort and money he spends on civic and charitable causes, the Common Man founder recoils at being called a philanthropist. His charitable efforts have often taken him far from the Granite State, however, including trips to Ground Zero after 9/11 and New Orleans after Katrina. He has also gone on relief missions to Haiti and Honduras after earthquakes hit those island nations, and to Puerto Rico following the 2017 hurricane disaster. “I had a van full of nonperishable food, a propane tank and a portable grill,” Ray says, describing a 2005 trip to New Orleans with Plymouth nurse and future Bridge House director Cathy Bentwood after Katrina’s winds and floods had devastated that coastal city. “I went to churches, cooking food for people all over New Orleans.” Arriving some nine days after the storm hit, Ray extended his rescue efforts to some of the city’s four-footed residents, stranded in homes that had been evacuated. Climbing in through windows, he retrieved and fed a number of dogs that had been left behind. In October 2017, Ray went to Puerto Rico to volunteer and cook for residents after Hurricane Maria. Ray, it seems, has put the same pedal-to-the-metal effort into his charitable and relief efforts as he has in building his impressive network of restaurants and diners. But what has motivated him to work so hard for so long to keep it all going, acquiring and retrofitting buildings, adding one restaurant and diner after another to the Common Man enterprise? Commuters and vacationers now take our lovely Hooksett welcome centers for granted, but most locals recall what eyesores they once were. Neither of his two daughters ever wanted to work in a restaurant, he says, and both have long since moved on to careers of their own. Ray has been looking into the possibility of passing the entire business on to his employees without having it broken up into several parts. “I want it to be kind of a phased exit,” he says. “This is my 48th year of Common Man. I don’t have the desire or skill set to do this any longer. I think it’s time to step aside.” Sitting at a table in the Step Above lounge, he looks around at his first Common Man and sees yet more opportunity for improvement. “I need to refurbish everywhere, but it’s not in my blood anymore,” he says. “I can’t throw myself into restaurants anymore.” But what would the hyperactive Ray do in retirement? “I don’t know,” he says frankly. “That’s probably what’s slowing me down.” It’s hard to think of Ray apart from the Common Man. And it’s hard to imagine him staying away from his restaurants for very long. “My most fun is meeting people, to go in and joke with people,” he says. A party at a nearby table breaks out into loud gales of laughter, bringing a smile to the face of the uncommon man who opened the door to food and drink and laughter at the first Common Man nearly half a century ago.